Blue Prynt Restaurant & Bar in the heart of downtown Sacramento brings a dynamic approach to dining out with our commitment to our local urban neighborhoods and our passion for providing a meal to remember, all happening in a gorgeous restaurant setting. 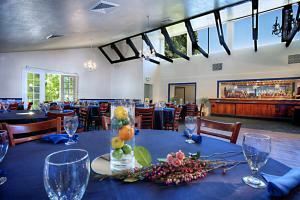 Blue Prynt Restaurant 's Banquet facilities are an excellent choice for your next event with three distinct rooms and locations for varying event sizes. An upstairs private reception room complete with its own bar is perfect for large groups up to 150. A private boardroom that accommodates up to 35 is perfect for your next luncheon or dinner, with all meeting necessities provided. For a more intimate dinner of up to 12, a semi private area is complete with a gorgeous dining room table nestled in an intimate corner of the restaurant. Blue Prynt Restaurant & Bar management and staff are committed to creating the perfect customer experience while raising your expectations for the future - please get in touch with us to plan your next event. Contact Banquet Services for copy of terms and conditions. $1000++ minimum during week, and $1500 minimum plus tax and service charge (20%) on weekends and holidays. Our Blue Prynt Banquet Room is a fabulous space for your party. It is located above the restaurant and features a private elevator, french door designed windows and balcony, vaulted ceiling, skylight windows, chandeliers, natural wood dance floor, DJ Booth, private restrooms, audio visual support / wifi, and a full bar. It is 1750 square feet, private, secure and self contained. Our Banquet Services feature the highest quality menu offerings at the best value in greater Sacramento. We also have plenty of parking because we can use the Sutter House Best Western parking in addition to our own. I am attaching a Banquet Menu for your review and consideration. Seats up to 35 comfortably for a meeting, meal or social occasion. Seats 140 in restaurant at tables and booths. Bar seats additional 30 for appetizers and food while enjoying sporting events. I recommend Blue Prynt Restaurant & Bar as the services were great, staff was friendly, the food was awesome, and the ballroom was perfect! Great place!